It is the only thing Austen knows. We are trying to teach him about losing, you know trying our best to beat him at board games, soccer in the backyard (I can still beat him! ), mini golf, football, etc. It is hard sometimes because this kid is pretty good at everything he does and gives it his all so Tom and I really have to work hard at beating him and we are adults! Take this summer in mini golf. I have no idea how this kid is so good. First time he plays, he beats me and almost beats Tom. Second time he plays, he comes in third behind Tom and me. And, I had a really good game. He was only off me by 7 strokes and he is 7! Still this wasn't good enough for him. Despite Tom and me telling him how good he was for a 7 year old, he wanted to win! We saw this fire in him from an early age. He didn't like to lose when we started playing board games with him so we started to beat him more often and if he would cry, we wouldn't let him play again for so many days. Some may see this as tough love but we think it's important that he does learn to lose. Especially during an era where they don't keep score during games and everyone's kid receives a trophy for participating. Don't get me wrong though, I love that Austen has the fire to want to win at everything, but I believe it is our job as parents to teach them how to lose too and how to do it with class and grace, and still be proud of yourself for the job you did. 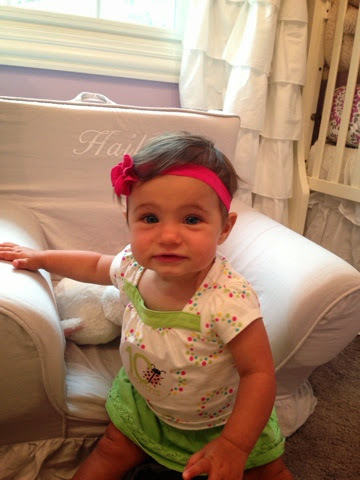 Last week, Hailey hit the 10-month old mark. Hard to believe she has been part of this world for as long as my pregnancy with her. She weighs in at 18.5 pounds now and is still the peanut of the family. But she smiles all the time and revels in watching the world around her including her big brother, big sister and dog. 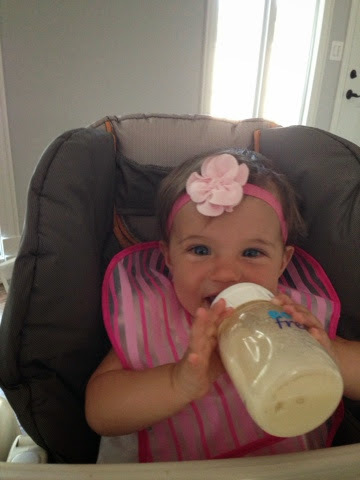 Hailey started holding her own bottle a few weeks ago. She is sitting up from a laying down position very easily and she is starting to pull to a standing position in her crib. She has been ready to crawl for a few weeks now but yesterday she finally got the motion right and started going forward instead of backward. No more putting her down and knowing she can't move anywhere! 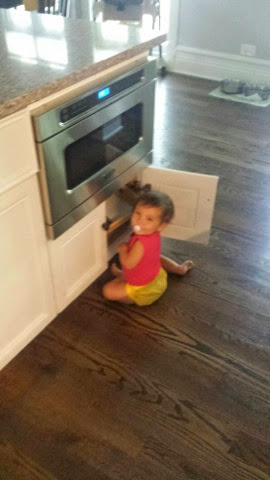 Guess we better get those baby gates installed and get the locks for the cabinets too! I always say the first two years are amazing as there are so many firsts they accomplish in such a short amount of time. With year one almost down, we are looking forward to ywlear two...of course with a bit if nostalgia! It took me awhile but the last few years I finally learned that to feel like I really had a vacation, I needed to take two weeks off instead of one. So after we returned from a week in Michigan, I had another week off for my summer staycation. The kids were off too meaning no camps. So what did we do? Because I needed to have plans?! 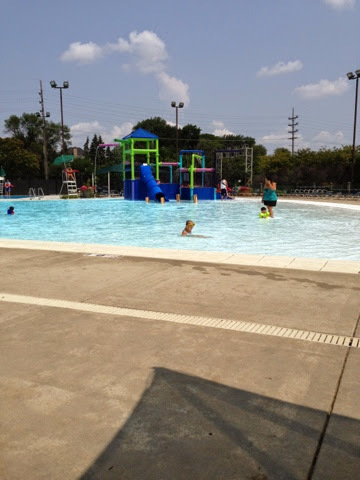 Hit the pool twice. Austen is becoming more brave. He went off the diving board. So he jumped only but hey, it's a start. Hailey is getting more used to re water too. Went mini golfing much to Austen's liking. Second time for him and he again got three holes in one and it was a challenging course (more on my little competitor in a separate post). 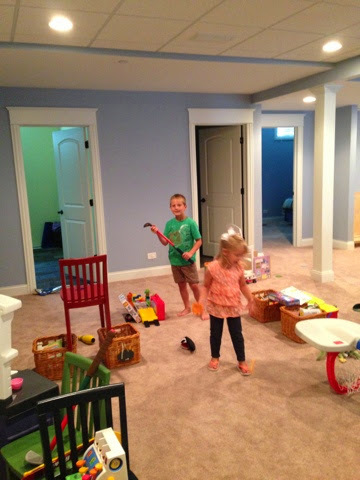 They also made their own mini golf course. Very creative of them! It was awesome! 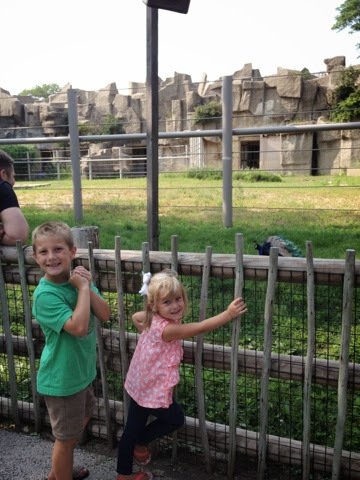 The zoo (Peyton wanted to see the giraffes). 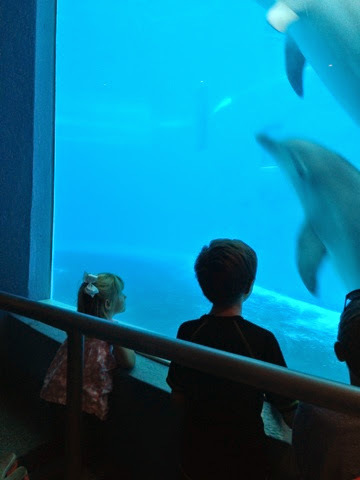 She was fascinated by the dolphins though. 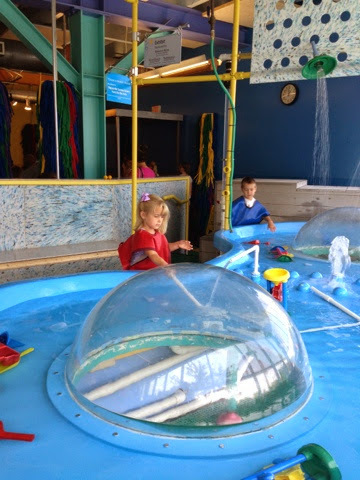 The Children's museum. Austen was more interested than Peyton aside from the water play. I remember this museum being so much better about 10 years ago when I took my niece! I think it is time for an update! A movie - Planes 2. No,Hailey didn't go! She had a babysitter which was nice to just spend time with the older two. Back to school shopping where they got to pick out some of their own clothes. With my stamp of approval of course! Hailey also started to hold her bottle too during this week. Makes feeding her a whole lot easier unless you are not watching her in the car, high chair and she dumps the whole thing upside down and shakes it, soaking herself. We have had to take apart and wash the entire car seat because she did this recently. Of course she soaked herself too. All in all, we did a lot of fun things. The kids have been enjoying time off with mom, dad and both their grandmas. But, I think even they will be ready to go back to school soon. My summer vacation is coming to an end. I swear, I should live in Europe where they get like six weeks off in the summer. Now that's the way to live and enjoy life. I did indeed have a nice, long two weeks off to spend with my family and friends. I crammed a lot into two weeks and it felt like I did a lot with my kids, my husband and my friends but it was also so relaxing not to have to wake up and go to work either. So my first week off started out in Michigan. We rented a beach house for a week, brought the dog and the kids, visited with family and friends who were up there, soaked in the sun at the beach and visited some cute little beach towns. Here is a summary of our trip and funny pictures! Spending time with Grandma watching the sunset (Peyton is quite the character). Adler even got to come on vacation. If you know us, you know we try to bring her everywhere we can. She's my girl and I smuggled a new toy and treats into our cart at the grocery store for her. Hey, the kids got shirts, she should get something too! Never mind trying to get Hailey to smile, we need Peyton to quit making funny faces when trying to take a nice picture of our family! This child is going to be my greatest challenge. But I can't help but love every bit of her stubbornness, sarcasm and wit. She reminds me of me, only better! My master creator. I am sure he's going to be an engineer, architect or something similar. He loves to create (and rope his dad into building sand castles). 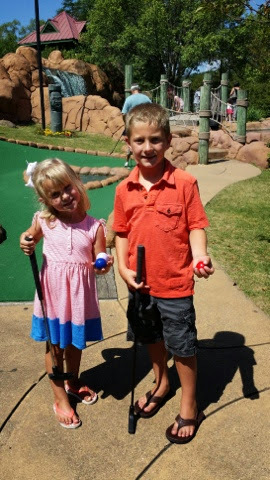 The first time playing mini golf together. Austen got three holes in one and beat me! I was playing for real too! The kid's a ringer. I think he's good at every sport he tries. 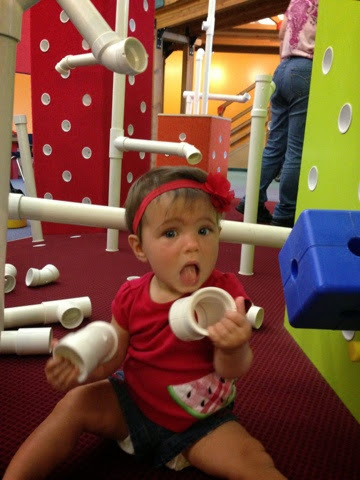 Peyton was a great sport too and enjoyed her first mini golf experience. Austen begged us to play again every day after. Hailey loves the sand. Not cold Lake Michigan so much but that's growing on her too. 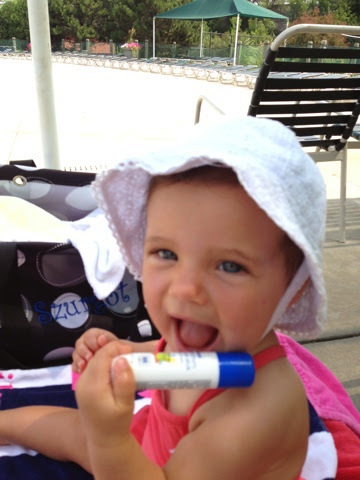 Give us another summer or two and we'll turn her into a beach baby like the other two. Perfect family photo of the kids and Adler, but Peyton "accidentally" steps on Austen's cut foot. Papa came to visit and we went to this cute little restaurant in downtown Douglas called the Wild Dog Grille. Best meal of our vacation. Last day there and we had to wear coats. Hailey was taking the picture. Ha! Ha! Stay tuned for more from our exciting vacation...to be continued.